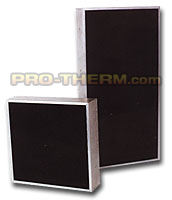 Advantages of Protherm, LLC Series CB heaters over ceramic fabric faced heaters. Glass/Ceramic Face- Face can be cleaned and product does not stick as easily. Repairable- Glass/Ceramic face, elements, and internal board can be individually replaced as needed, saving you money. Faster heat to product and higher efficiency heat transfer- IR from internal elements starts transmitting through the glass-ceramic to the part immediately while face and mass temperature stabilize. Higher quality- High temperature ceramic fiber material is used as internal insulation to reduce back losses for better efficiency. Terminal boxes- For your convenience and safety, terminal boxes are provided as the standard with lead wires and ceramic wire nuts. Custom options- Custom sizes, mounting, and connections can easily be made. Available- We will be happy to repair or supply a single heater or replacement parts at normal prices and a fast turn around. Eventually all heaters need repair from damage or long use. The cost of repairing individual parts as needed instead of replacing a complete heater will save about 50% or more. This makes a Protherm, LLC CB a better value for long term savings, efficiency, and reliability. PROTHERM, LLC™ series CB heaters are efficient, long to medium wavelength infrared panel heaters designed for rugged industrial heating applications requiring excellent uniformity. Operates at surface temperatures up to 1350 F(2.9 micron-peak). Designs up to 25 watts per square inch. Unique black glass/ceramic face material. Efficiencies exceeding 83% have been proven. Heats up to processing temperatures in about 3-5 minutes. Cools down to "safe" temperatures in about 5-10 minutes. Operating life in excess of 10,000 hours is expected when operated at 80% of rated output. We have some original heaters still operating after 20+ years of use. Resistive load can be precisely controlled. Series CB heaters can be mounted in any direction as long as the internal elements remain horizontal. Element direction is indicated by an arrow stamped into the back cover and normally run in the long direction. Element direction can be made across the width, but must be specified at time of order. We encourage customers to let us know how the heaters are being mounted and applied in new applications so we can assure you get the longest heater life possible. 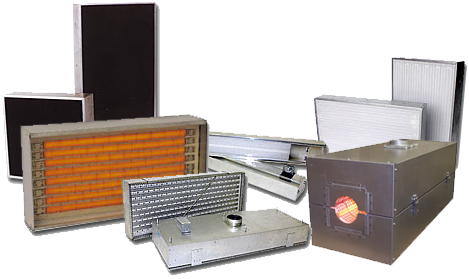 Click here to view General Instructions and Warnings on the Series CB Infrared Heaters.